Belts are just handy aren't they? I mean they stop your trousers from falling down for starters. Yet it never ceases to amaze me how many tradesmen fail to cotton on to this benefit. In fact having a builder's bum cleavage staring you in the face is a daily occurrence on most construction sites. So much so I could probably just as easily identify the tradesmen I work with from their backsides as from their faces! So if you're reading this and think you may be a culprit yourself, then please for the love of god buy yourself a cheap belt. Your fellow tradies will love you for it! But while normal belts serve their purpose (if not always on site), you can also buy a different kind of belt that will do much more than just hold your trousers up. And by that I mean a back support belt. As wearing one of these belts as you work will assist your core muscles in supporting and protecting your spine, making them a great investment for anyone working in construction. And they are especially useful during periods of heavy lifting and hard labour, helping to keep your back free from the aches and strains that are so common at the end of the working day. So if a lumbar support belt sounds like something you need to add to your tool kit then read on. And I'll take you through my recommendations for the best back support belts for construction workers, including my top choice which is the Maxar Deluxe Work Belt. Best overall for support and heavy lifting - Maxar Deluxe Work Belt. 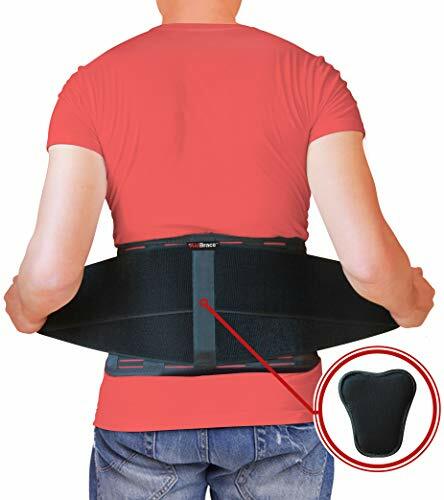 Good value belt with great support - Aidbrace Back Brace Support Belt. Good for movement and driving - Mueller Adjustable Back Brace. This guy needs a belt! We have it tough in the construction industry. As not only do we have to spend long hours working hard physically in all weathers and conditions. Years of performing repetitive tasks, heavy lifting, twisting and turning can also seriously damage our backs if we're not careful. For instance, official government figures from 2015 of work-related musculoskeletal disorders in Great Britain found that the highest rate of workers to suffer from chronic back pain were in the construction and agricultural industries. And that there were more than twice as many people suffering from chronic back pain in skilled trades in the construction industry than the average across ALL other industries. This back pain is not only frustrating and debilitating, it also leads to taking more days off work. And if you're self-employed like me you'll know this can seriously affect your potential income. So with this in mind we need to do all we can to keep our backs strong and healthy, and this is where a wearing a lumbar back brace or lumbar support belt can be a big help. How Does A Back Support Belt Work? Makes sure that your 'abdominal balloon' stays inflated. The theory behind wearing a back support belt or lumbar back brace is exactly as the name suggests, to provide support for your back. However it actually does this by compressing your abdomen rather than your back. The idea is that by holding the stomach in with the support brace and putting pressure on the abdomen you increase the support and reduce the load on your lower back. This theory originated in Canada in the 1950s, and to get a good understanding of it we'll use the visual example of the abdominal area as a balloon that inflates when compressed to explain the process. So when you bend down to lift things your abdomen becomes squeezed and the inflating 'balloon' pushes outwards, which leaves your spine to take on the full burden of the lift. However if you activate your deep-lying core muscles as you bend and lift, this balloon is forced upwards rather than outwards, where it provides support for your spine by making it more rigid. And wearing a back support belt also provides a similar result. As by compressing your abdomen it forces the 'abdominal balloon' upwards, which supports your back and lowers the load as you work. And in addition to this a lumbar support belt also limit your range of motion as you twist and bend, which lowers the risk of overstretching. So it makes sense to wear a support brace lifting heavy objects or getting stuck into some heavy labour. What Are The Benefits Of Wearing A Back Support Belt At Work? Keep smiling on site by wearing a back support belt. They assist your core muscles in supporting and protecting your back as you lift and work. While also lowering the load on your lower back. They work as a posture corrector and encourage you to maintain a good posture, which helps to spread the pressure evenly over your body as you work. This helps to reduce injuries and pain in your back by reducing the strain put upon it. They will stop you from overstretching yourself and help you to stick to a safe lifting technique. Wearing a back support brace will also provide heat to your lower back area, which helps to keep your back muscles warm and loose as you work. They help you to work on days when your back may be aching or feeling a bit tender. They are good for people with a herniated disc, providing compression and stability. So it makes sense to have one of these belts at hand to call upon when needed. Beware the pitfalls of wearing a back support belt. While lumbar support belts are a big help for construction workers, they are not a miracle cure. So don't make the mistake of thinking they'll make you invincible on site! As this is a one way street to injury city. Becoming too reliant on a back support belt can weaken your core muscles over time. So limit its use to the times when you really need it. Wearing a back support brace can make you overconfident and cause you to lift heavier loads. So make sure you don't overdo things. You also need to be using safe lifting techniques alongside wearing the belt to keep your back safe and protected. It won't make you Superman. It's also vital that you stay active outside of work to keep your back fit, healthy, and able to withstand the pressures of construction work. This includes regular stretching for flexibility, core exercises for support, and aerobic exercise for fitness. And be careful if you suffer from high blood pressure, as the increased pressure on the abdomen that the belt creates can lead to a further increase in blood pressure, which can heighten the risk of strokes and heart attacks. This is actually a difficult question to answer. Because back support belts come in a variety of designs, with each support brace serving a slightly different purpose. This means you can usually find one to suit your specific needs, but you need to shop around a bit to find the right one. I've listed the Maxar Deluxe Work Belt as my top choice here because it has the best level of lumbar support. However you need to take a horses for courses approach and decide which one of the following recommended belts would suit you the best. And this depends on which type of activities you are involved in during your workday. As some are great for offering lumbar support but can be a bit bulky to wear, while others may not offer the same level of support but will be more comfortable to wear. So I've picked out what I consider to be the best belt for workers that do lots of lifting, a value option with good support, and the best lumbar lower back brace for moving around and driving. If your job on site involves a lot of back breaking work, then you'll need a sturdy belt that can stand up to the challenge. And to do that it needs to tick two boxes. Firstly it needs to offer an industrial level of support that will protect your back when lifting and moving the heaviest of loads. And it needs to be made of high quality material so that it's durable and able to withstand heavy use in tough conditions. So our top choice that does both of these things well is the Maxar Deluxe Work Belt. Industrial strength belt designed with the work market in mind. 6 spring metal stays for added support. 2 additional side pulls for better fitting and tension adjustment. 8" wide extra strong breathable double mesh. Detachable suspenders for extra stability. Made In The United States from high quality materials. Additional side pulls means you can adjust the pressure and tightness to your liking. Narrow straps at the side make the belt more comfortable to wear. Velcro straps means it holds in position well. Provides industrial strength support to the lumbar area. Metal stays give your back increased stability. As this is an industrial strength belt which has been designed especially for the manual labour market. And it's great for providing workers with extra back support when lifting and moving heavy objects. This is due to the 6 metal stays within the belt that provide great stability and support to your lower back, as well as the 2 side pulls that allow you to adjust the tension and snugness. And keeping the belt nice and snug around your waist will work as a posture corrector and help you to maintain a healthy posture when attempting to lift heavy loads. This belt is also a good choice for people with long-standing back problems, as the strong support is a great help if you are trying to ease yourself back into work after an injury. The design of the belt also makes it comfortable to wear, being made from a breathable mesh that keeps you cool and prevents excessive sweating. Also the narrow side straps stop the belt from digging into your sides during prolonged use. And it's a good fitting belt which holds its position well as you work. However the extra focus on support and sturdiness may mean it's not the best choice if your job involves more movement than lifting. And while the belt is very well made it can stretch over time, so may need replacing every so often if used heavily. All in all though this is one of the best industrial back support belts on the market and is our top choice for back support belts for construction workers..
As it's great for anyone whose job involve heavy lifting, yard work, or moving heavy objects. If you need a back support belt with great support but are working on a tight budget, then you should check out the Aidbrace Back Brace Support Belt. Made with thick and durable material so built to last. Breathable vented mesh backing to keep you cool. Velcro side straps so you can adjust it to the tension you want. Can be worn comfortably for long periods. Curved design at the sides for extra comfort. May be too bulky under certain clothes. Other belts may be more comfortable if you move around a lot during the day. One of the best value belts on the market for providing strong support for your lower back. Concentrates compression to realign the spine as well as support it. Great support for people that do lots of heavy lifting. As this one is also an industrial strength belt that will work well for protecting your back when taking on heavy lifting tasks on site. One of its big plus points is that it covers a larger area of your lower torso than other belts, so you get a wider amount of protection. This also makes it a great posture corrector, encouraging you to maintain a healthy posture as you work which will ease the strain and pressure on your body. And while it covers a larger area, abdominal compression still remains concentrated on the areas where you need it. This belt is fairly comfortable too, with a breathable mesh that keeps you cool while you wear it. It's also made of high quality materials that will last for a long time and be able to withstand regular use on site. However the fact that it's so sturdily built means that it's bulkier than other belts, so you may not be able to wear it comfortably underneath your work clothes. And it tends to ride up when seated, so it's not the best choice for driving either. Also the stronger support means you don't get as much flexibility and freedom as you do with other belts. So if you have a job that involves plenty of bending, twisting and moving around then this may pose a problem. But if you're looking for a belt to support your back when lifting heavy objects at a fair price, then this one is a solid choice. If rather than heavy lifting your job requires you to be mobile throughout the day, then you can afford to lose a bit in the way of support to get a belt that is more comfortable to wear. And this is also the case for those that drive for a living. As despite offering fantastic support, heavy duty belts can be a bit cumbersome and constrictive. And the last thing you want is to feel uncomfortable as you are moving around or sitting behind the wheel. 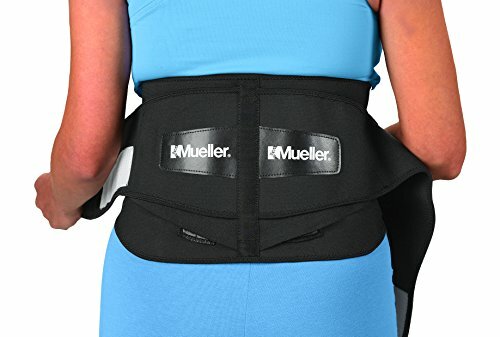 So a good back support belt that doesn't restrict your range of motion is the Mueller Lumbar Support Back Brace. 8 flexible steel supports along the spine. Internal molded plastic component to stop the belt from bunching. Adjustable tension straps means you can adjust the pressure and tightness to your liking. Removable lumbar pads allow you to make the belt less constrictive. Covers a large area of your lumbar which may not be comfortable for all. Provides medium level of support to the lumbar area. Not the best option for heavy duty workloads. This versatile belt is great for workers who need to be on the move throughout the day, as it comes with removable lumbar pads. Which means you can choose to leave the pads in when you need them for support, but you can take them out when you want more comfort and freedom of movement. So your abdomen will still be compressed without the pads (meaning your back is supported), but the belt won't feel as bulky as you move around. Which also makes it a great belt for people that drive for a living, as you can sit in greater comfort than with a many other belts. There are adjustable inner and outer bands that add to the comfort by ensuring it's a snug fit, while the internal molded plastic component is there to stop the belt rolling or bunching. And it's made from a lightweight and breathable material that will keep you cool as you wear it. And while it lacks a bit in support compared to the previous two belts featured here, it will still give you a decent level of support as you work. As it's reinforced with 8 flexible steel supports along the spine that offer a medium level of support for your lower back. So this slight lack of support compared to other belts means that if your job involves lots of heavy lifting and heavy duty work then you may need to look elsewhere. 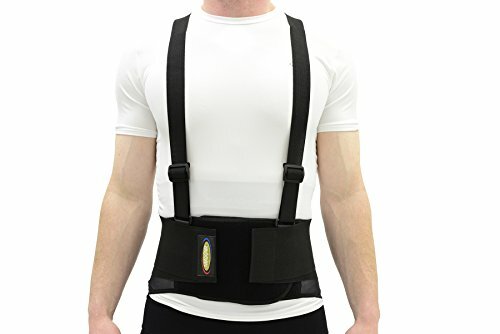 But if you need to move around throughout the day and only get involved with light lifting and labour tasks, then the Mueller Lumbar Support Back Brace is a great choice. As the name suggests, back support belts are a great way of giving your back the extra help and protection it needs when carrying out heavy work tasks. And they are a great posture corrector too. As they compress your abdomen to increase support for your back, assist your core muscles, encourage you to maintain a healthy posture, and take away the temptation to overstretch yourself. And the 3 belts I've featured here are all good options, depending on your daily tasks and needs. But whichever belt you decide to go for, just remember that it's for assistance only. So you also need to keep your back and core muscles strong outside of work with regular exercise and practice safe lifting techniques to gain the full benefits. And on a final note one of the biggest bugbears from people buying a back support belt is the difficulty in getting the right size. As some makes come up smaller than expected while others come up much larger. So before you order yours just have a quick read through the size guide, measurements, and comments to make sure yours will fit you. And then you'll be on your way to a happier and less painful workday with your new back support belt.